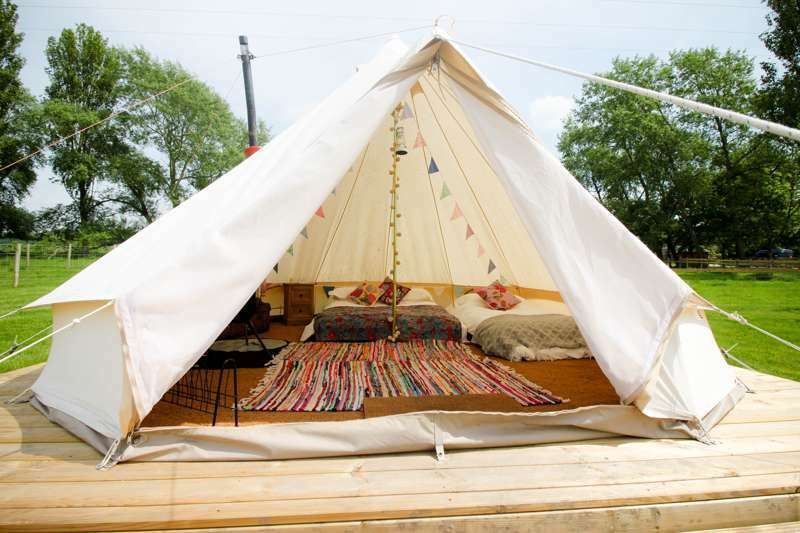 Find yourself sleeping under the stars in beautiful luxury bell tents, a modern approach to camping. Each bell tent is fitted with insect screens, air vents and wood burning stoves. With its undulating downland, ancient forests, and ubiquitous vestiges of our neolithic past, it's easy to see why the North Wessex Downs holds such an evocative place in the imagination. Between the Cotswolds to the west and Chiltern Hills to the east, this sprawling Area of Outstanding Natural Beauty has long served as a natural muse for the great and good of literature. And with such a captivating setting, it's not hard to see what inspired the team behind Highway Hill to create their relaxing glamping haven in the heart of the Wiltshire countryside. Comprising a trio of homely shepherds huts, two furnished bell tents and a gypsy caravan, Highway Hill offers both comfort and convenience, whilst retaining an authentic immersion in its idyllic rural setting. The three huts are perfect for glamping couples. Egyptian cotton bedding, atmospheric wood-burning stoves, and a fully-equipped kitchen makes these hand-crafted hideaways the natural choice for those seeking a self-contained romantic retreat. 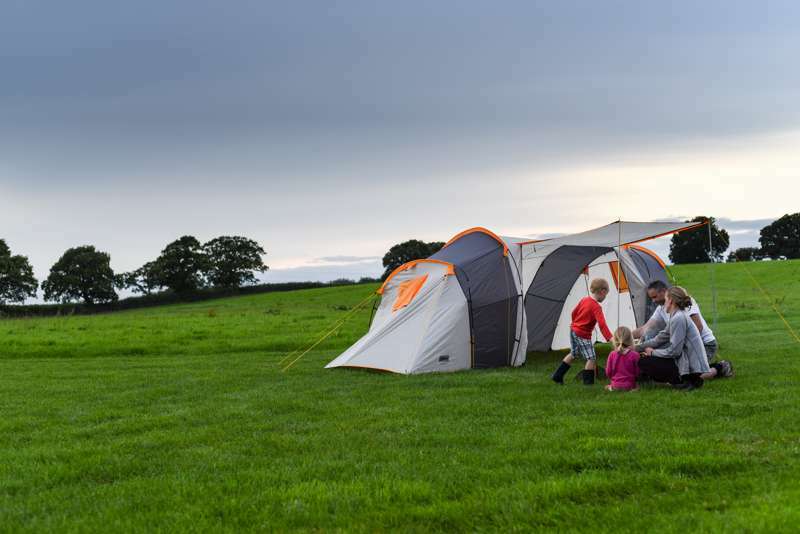 The slightly bigger bell tents (sleeping up to three) mean small families are catered for. Inside, bunting abounds, fairylights festoon the central pole and thoughtful little touches like vintage trunks, vibrant throws and that all-important wood burner mean the bells are an equally inviting space to unwind on those cooler evenings. Facilities-wise, proper hot water showers, disabled-friendly toilets and a communal kitchen are all available. Conscientious extra touches like hammocks and high-chairs illustrate your hosts' attention to detail. And with basic provisions from pasta and porridge oats to lanterns and linen supplied, a stay at Highway Hill represents an incredibly good value break in one of England's most desirable regions. When not relaxing onsite with a good book or getting to know the adorable resident alpacas and pygmy goats, there's no shortage of places to explore from this superbly-located base. Innumerable footpaths and bridleways offer invigorating walks (of varying intensity), leading to some of Wiltshire's most interesting sites. Take the picturesque seven mile stroll to the Cherhill White Horse, one of thirteen of these iconic equine chalk figures that dot the Wiltshire hillsides. Although not quite as antiquated as popular belief would have it (the oldest surviving one at Westbury dates back to 1770s), the county can still stake a worthy claim as the cradle of ancient Britain. With the mysterious stone circles at Avebury and the neolithic burial tomb at West Kennet Barrow all within easy reach, Highway Hill really does make the prime base for any pre-history buffs. And with the Georgian-Roman splendour of Bath a mere 45 minutes away, you can really enjoy a whistle-stop tour of England through the ages. Highway Hill is a family-run business aimed at people who love the outdoors. We’re located within the North Wessex Downs Area of Outstanding Natural Beauty, a stunning landscape of ancient woods, gently meandering chalk springs, and rolling downland, offering peace, quiet and relaxation. Staying at Highway Hill in one of our shepherd’s huts or bell tents, is a very special experience. You can choose a traditionally-built shepherd’s hut or spend a night under canvas in one of our very spacious bell tents; our Hayloft is perfect for classes, special occasions, meetings and group events. All our accommodation is finished to an extremely high standard. Wood burning stoves offer warm, cosy nights in, whilst our futons and soft and cosy bedding make for a good night’s sleep. In the summer, you can barbecue just how you like it. Even our fire-pits add to the atmosphere. As night falls, toasting marshmallows, telling ghost stories or whiling away the evening hours as you watch pictures in the embers will prepare you for a restful night’s sleep. Switch off from the hustle and bustle of everyday life and switch on your senses! Soak up the atmosphere and tune into nature at Highway Hill. For latest availability and best prices for Highway Hill, please use the Date Search above. 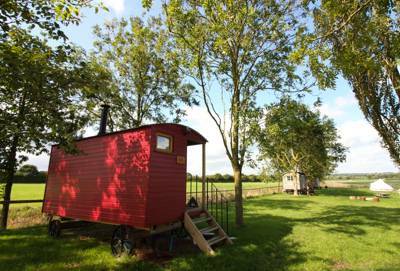 3 shepherds huts (sleep 2), a pair of bell tents (sleep 4) and a gypsy caravan (sleeps 2). Shepherds huts have electric lighting and plug sockets, plus a fridge or electric coolbox, and gas or electric hob. Bell tents don't have electricity, but do have battery powered lights. Tent guests can access electric sockets either in the kitchen (where they will also find cooking facilities) or via the outdoor socket near the campsite. 2 showers and 3 toilets next to campsite, with another 3 toilets and 1 shower next to office and kitchen; of these, 1 of the toilets plus the shower is wheelchair accessible. Shepherds huts have fire bowls that can be used as a BBQ or a small firepit. All guests have access to the large firepit in the campsite (complimentary firewood). Board games, cards and jigsaws to borrow, plus maps and books detailing local walks and flora and fauna available. There are plenty of fantastic walks starting close by, including a pleasant 7 mile trek to the local Cherhill White Horse, one of numerous chalky equine hill figures found across Wiltshire. A 15 minute drive away lies the ancient stone circles of Avebury, along with a museum and various other attractions in the village including the National Trust owned Avebury Manor (01672 538016). There are also several other Neolithic sites in the region, such as West Kennet Long Barrow. The Georgian stately home, Bowood House (01249 812102), is about a 15 minute drive away and features a famous adventure playground for the little ones, as well as stunning grounds designed by Capability Brown. The iconic city of Bath, with all of its Roman and Georgian attractions, is also just 45 minutes away. Basic provisions such as milk, tea, coffee, sugar, oats, pasta and farm-fresh eggs are supplied on arrival. Guests are welcome to use the oven, microwave and other cooking facilities in the main kitchen, and pre-made meals can be ordered too. The White Horse Inn (01249 813118), found about 2 miles away in Compton Bassett, offers a sophisticated spin on pub grub classics, while The Duke Hotel (01793 823026) in Hilmarton boasts the best of the beer gardens. 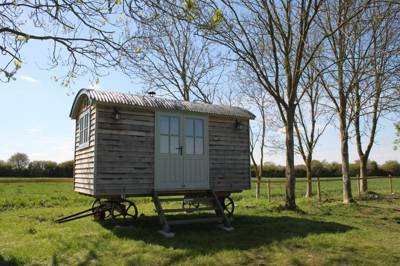 Shepherds huts and gypsy wagon: March–mid-December. 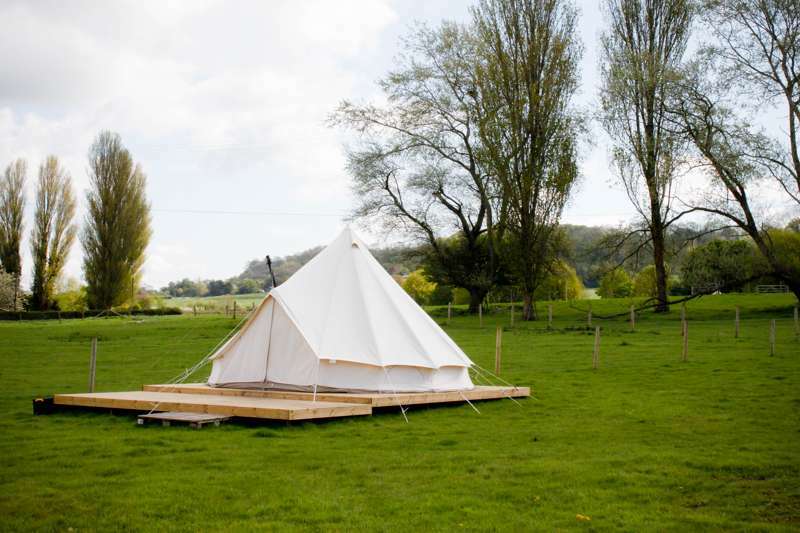 Bell tents: March – October. 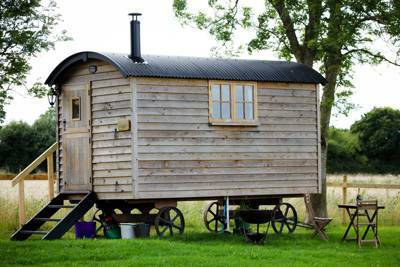 Shepherds huts £60–80 per night. 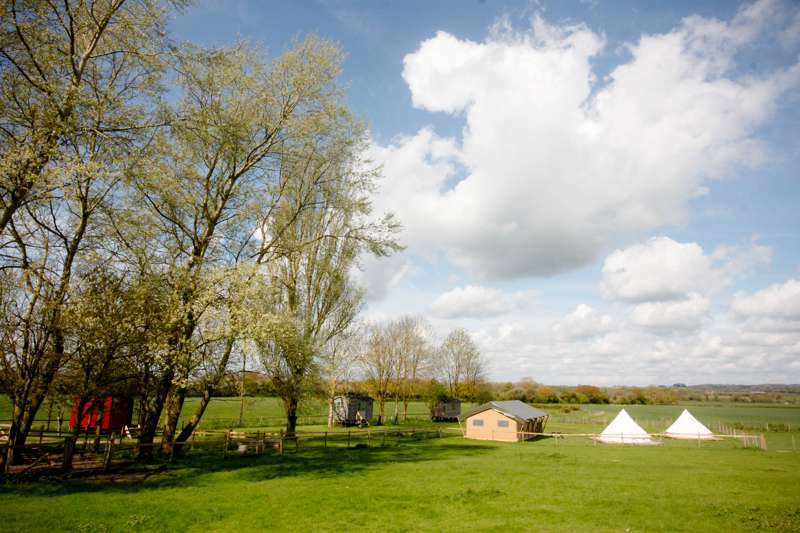 Bell tents £40–60 per night. Gypsy Caravan £45–£65 per night. 5% discount for 5 nights or more, 10% discount for 7 nights or more. Single night stays have a £25 surcharge. Highway Hill is easily accessible from the M4, from either Junction 16 (Swindon and Royal Wootton Bassett) or Junction 17 (Chippenham). More detailed instructions will be sent upon completion of booking. Nearest train stations are Swindon and Chippenham, and the 55 bus can take you from either of these to the nearest bus stop at The Duke in Hilmarton. Highway Hill is about 2½ miles away from the bus stop so you will need to arrange a taxi for the final stretch. Alternatively, a pre-booked taxi from Swindon or Chippenham will cost around £20.